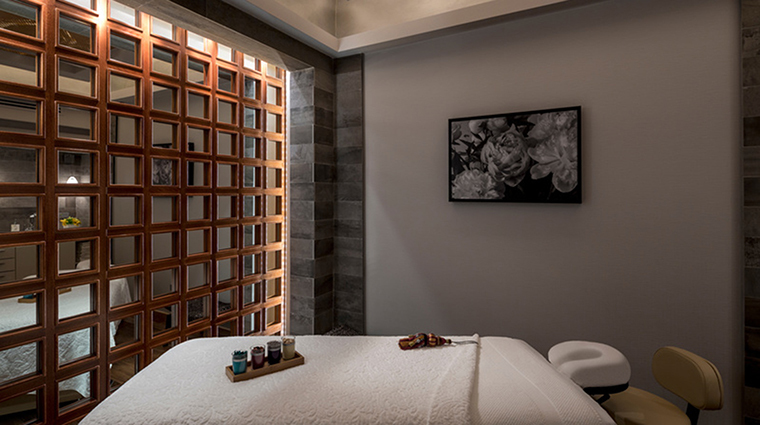 You probably envision palm trees and tropical drinks at a Puerto Rico spa, but you won’t find anything so predictable at The Spa at Condado Vanderbilt. Instead of colorful cocktails, purify with a glass of coconut water or cup of artisan tea, and nibble on the delicate bites gracefully prepared by Condado Vanderbilt Hotel's chef. As you wait in the coed lounge, relax on a plush beige-and-gold day bed or chat with your neighbor in one of the roomy armchairs. From there, your experience only gets better. 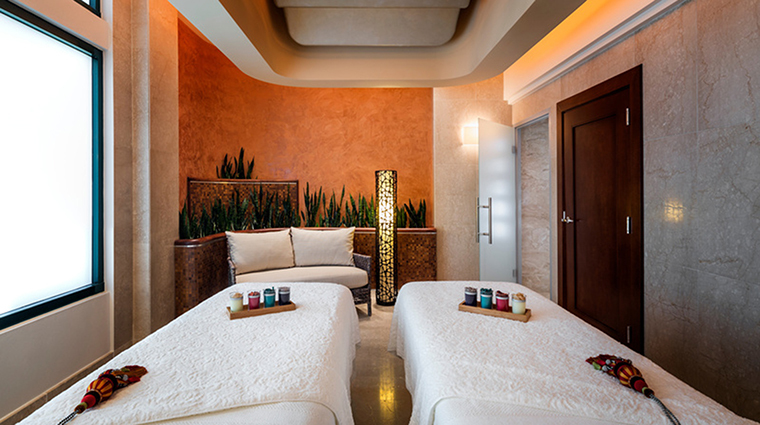 This luxury spa is the spot place in Puerto Rico that offers hammam treatments. The Turkish hammam treatment is one of our favorite pampering experiences in which a skilled technician massages you with airy bubbles, buckets of warm, soothing water and a tingling dry exfoliation. 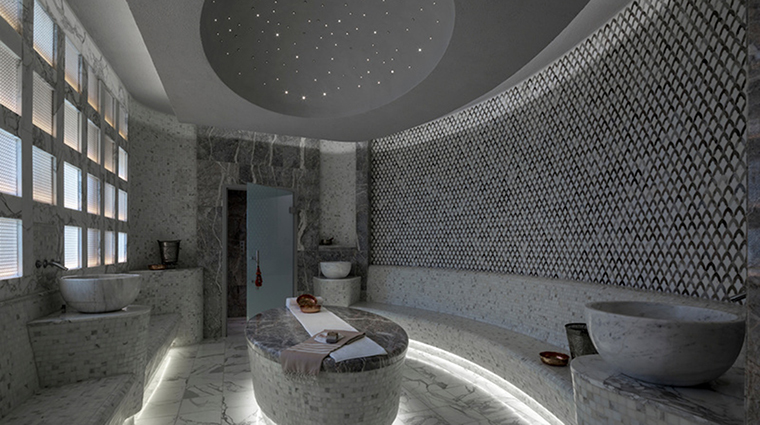 The room where hammam treatments are serviced is the most serene place in the facility, and it’s stunning as well. Gray and white marble tiles line the walls and benches, and the floor is made of white marble. The crowning jewel, however, is the large stone table in the center of the space. It looks like it just grew there, natural and ethereal. Lather up with sweet-smelling products by Red Flower, a company that parallels the spa in its use of natural flower oils. Despite all of the floral-centered treatments, men aren't forgotten. Of course, anyone can get a massage, but the luxury spa offers carefully crafted products just for distinguished gentleman such as a made-for-men VIP face treatment or a manicure and pedicure, nail polish optional. 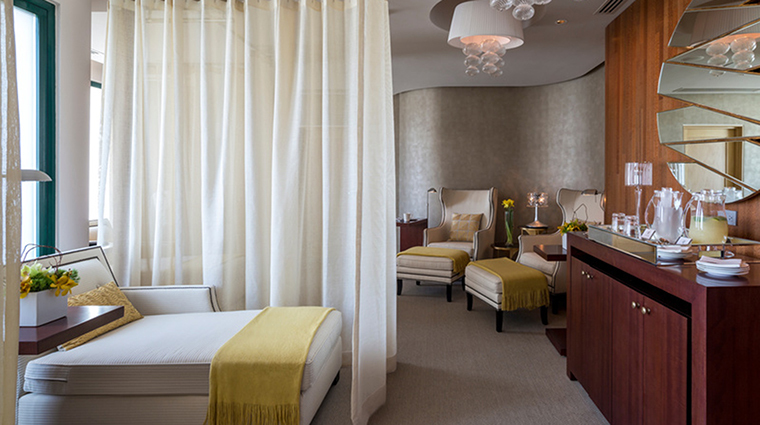 We recommend arriving 30 minutes before your reservation to take in the tranquil spa services. 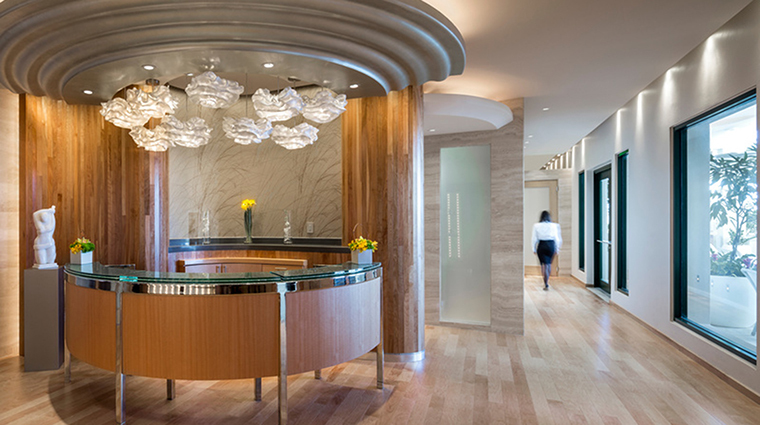 While the spa hours are from 9 a.m. to 7 p.m., resort guests have 24 hour access to the gym with their room key. You must notify the spa at least six hours before your treatment is scheduled to begin if any changes or cancellations are necessary. The spa has a plethora of wonderful treatments, including the signature massage featuring aromas like calming lavender, emotionally soothing gardenia, stimulating blood orange and mint-tinged ocean, which is meant to be restorative. Another winning option is the Bamboo Heritage Massage, a service that features bamboo stalks of various lengths treated with warmed plant oils. The firm stalks help stretch your muscles and ease tension. Facials are another area of specialty for the technicians. You’ll be guided to the service that best fits your skin-care needs, whether that’s an LED treatment (which diminishes wrinkles and age spots and clears up breakouts), the signature facial or any of the other three choices. As for the rest of the body, flowers remain a theme throughout, and you can expect gardenia and lavender to make their way into oils, wraps and anything else you might have rubbed on, soaked in or stimulated. 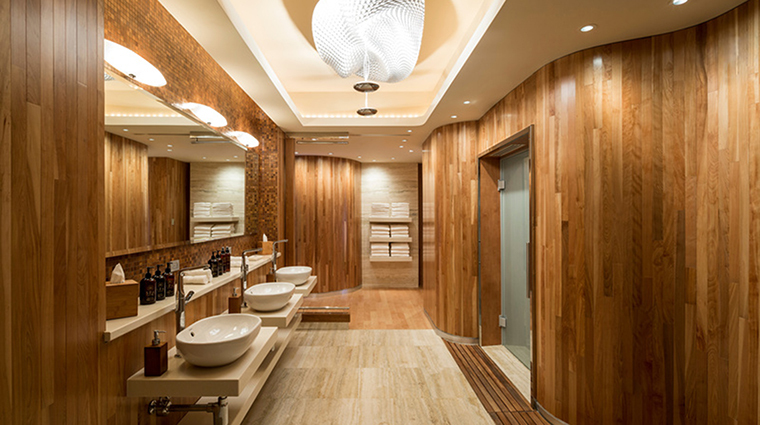 After all this pampering, take a moment to enjoy the chic wood-filled locker rooms. 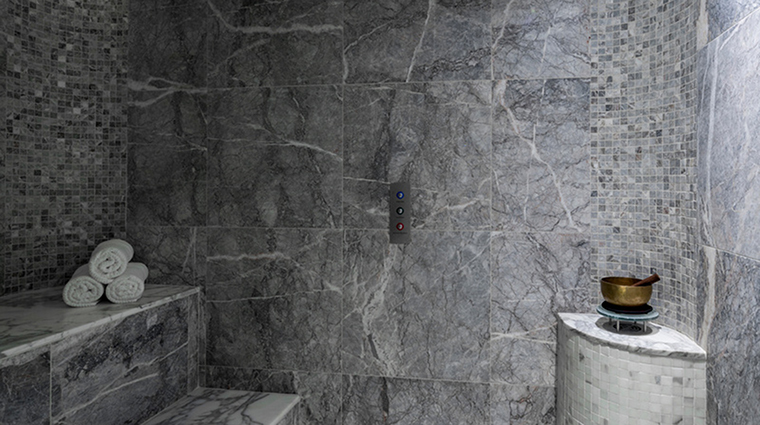 The San Juan spa has an amazing four-headed shower with an array of pressure that hits your body from all over. If you want some of your own oils to bring home, stop by the Aroma Blending Bar to pick up your own customized scent. Once you leave the spa, you will feel rejuvenated and ready for anything, whether you hit the ocean-view gym, sit by the pool or explore the town.